Kaytlyn and her family were a pleasure to host! Thank you for staying with us and we hope to have you back next year! It was a pleasure to host Joy and her family! We are thrilled to hear that they had a wonderful time and we hope to have them stay with us again! It was an absolute pleasure hosting Nelia and her family! We are so happy to hear that you enjoyed yourselves and hope to see you all again! Thank you for choosing Dunromin Cottages by the Lake. Thank you for visiting us and sharing your kind words. It was great to host you and we hope to see you again soon! We had the pleasure of hosting Michelle and her family. We are glad to hear you had a great time and we hope to have you back again! It was great meeting Julie and her family! We appreciate the kind words and are thankful for visiting Dunromin Cottages by the Lake. See you soon! We had a great stay at Dunromin Cottages by the Lake! The place is clean and newly renovated. It actually smells good and felt like home. We are grateful to have hosted Apoorv and his family. We look forward to having you back soon! Thank you for visiting Dunromin Cottages by the Lake! We are grateful to have had the pleasure of meeting you and hosting you. We look forward to having you back! It was a pleasure hosting Nicole and her friends. We are truly grateful for the kind words and look forward to having you back! We are grateful to have had the pleasure of hosting Jewel and her family! We appreciate your kind words and hope to see you all again soon. Thank you for visiting Dunromin Cottages by the Lake! 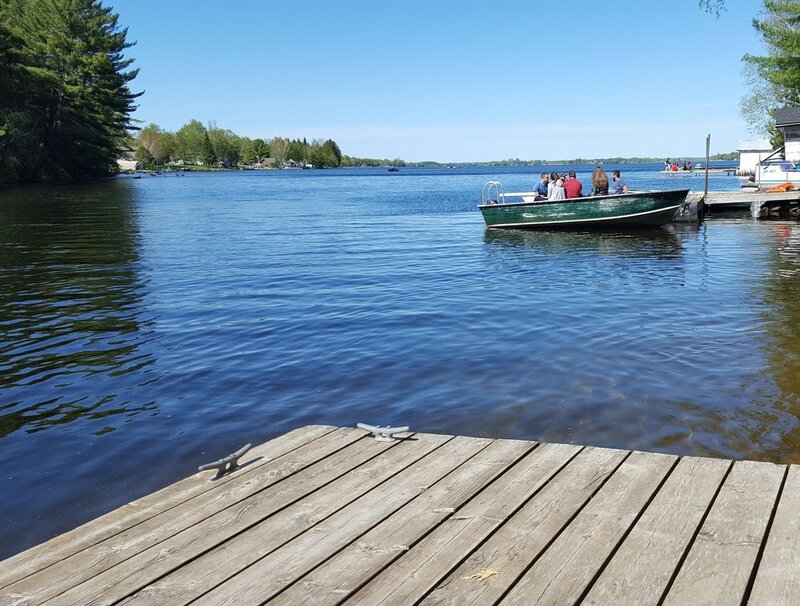 My family and I had the pleasure of staying at Dunromin Cottages by the Lake last weekend. We were staying in Cottage # 6 which was apparently the only one not fully renovated. I don’t think any of us would have even known. It had a gorgeous updated bathroom and that perfect “cottage feel” we were looking for. All the beds were super clean and comfortable! The kitchen was stocked with all the utensils you would need to cook anything indoor or outdoor - having the option to do both was great! The BBQ worked wonderfully as well! The property itself is in a great spot in the Kawarthas and on a beautiful lake. It wasn’t too far from the city either which I loved. They have canoes and a paddle boat you are able to take out. There’s a gorgeous island to paddle around or a lake to explore and fish on. Everyone in my family agreed that as soon as we arrived Alex (the host) made us feel right at home, himself and his business partner Mike, are both incredibly friendly and accommodating guys. There are two fire pits that everyone using the cottages can use, it was great to get to meet other people who were staying in other cottages - all very friendly people as well. You can tell that the property and cottages are very well taken care of. It’s a great atmosphere for an escape from the city. Over the entire weekend we were there, I think one of the things I heard most was “we need to come back here for sure!” Or “this should be our regular spot”. And we definitely will be! Thank you for visiting us and sharing your kind words. It was great meeting you and your family and we hope to see you again soon! It was an absolute pleasure meeting you and your family! We thank you for choosing Dunromin Cottages by the Lake for your Victoria Day Weekend getaway. Hope to see you all again soon! Thank you for choosing Dunromin Cottages by the Lake for your Victoria Day weekend getaway! It was an absolute pleasure meeting you all and we happy to hear that you had a great time. Hope to see you again soon! It was an absolute pleasure having you stay with us this Victoria Day weekend! We are humbled by your kind words and are extremely happy to hear that you all have enjoyed yourselves. We look forward to seeing you again! You guys are absolutely amazing! It was my second, and won’t be my last, time staying with you. The cottages are great, updated, very clean and comfortable. The grounds are extremely well maintained and have beautiful views. The staff are extremely helpful, approachable and friendly - second to none! Over the past 15 years I have chosen different spots to spend a week/weekend during the summer, but after staying at Dunromin Cottages by the Lake they are the best and I intend to keep coming back. Thank you for visiting and for your wonderful review. Helen, you are so sweet. Your "housewarming" gift will soon be displayed!! Thanks beautiful lady XO! As you can see in some of the pics, Miguel had a GREAT time on the lake! Nice catch :) See you guys soon! Thank you so much Diana! Both you and Tony were so nice. We are happy you had a great time! Can't wait to meet the kids :) See you soon!